As the most visible area of the body, the face receives a generous amount of attention with regard to rejuvenation treatments. 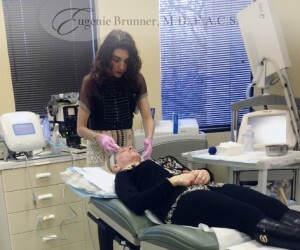 However, Dr. Eugenie Brunner, our experienced facial plastic surgeon, understands that all skin is subject to the natural aging process. To shed light on the available non-surgical enhancements for areas of the body that may be overlooked, she and her knowledgeable medical team recently hosted an exclusive event for our patients called Beyond the Face, which revealed how dermal fillers and laser treatments can be used to address common signs of aging below the chin line as well. Dermal fillers have long been used to help smooth away lines and address volume loss on the face, but did you know many of these formulas could be used on the neck, hands, and chest as well? During the special event, Dr. Brunner demonstrated how to diminish the appearance of horizontal wrinkles on the neck, vertical creases on the décolletage, and veins on the hands using Belotero Balance® and Radiesse®. As with cosmetic injectables, laser skin resurfacing can be surprisingly versatile too. Dr. Brunner presented some of the “off the face” applications of our popular laser treatments, including the ability to reduce the appearance of sun damage and common signs of aging on the hands, chest, and neck. She also emphasized the importance of seeking a skilled laser physician like herself when considering laser-based rejuvenation. The skin of the body doesn’t heal as quickly as that of the face, and the technology must be expertly adjusted to the suit the needs and goals of the patient to reduce the risk of complications and optimize results. In addition to enjoying facial and body revitalization treatments, the guests at Beyond the Face also had access to special promotional pricing for Belotero Balance®, Radiesse®, Xeomin®, and laser skin resurfacing packages, which featured the Clear + Brilliant laser and Fraxel® DUAL laser. Interested in learning more about our full body skin treatments and the Beyond the Face event? Contact us today for more information or to schedule a consultation with Dr. Brunner.